NEW!!! Fabric Samplers - Approximately 12" x 12" samplers of each our conductive fabrics. 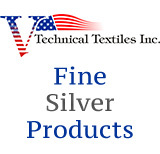 Below is your choice of all of our fabrics based upon price.